Color scheme options are endless with a GivingPress site. As with other changes to the website appearance, we’re going to use the Customizer by navigating to Appearance -> Customizer within the GivingPress admin. View color changes in real-time within the Customizer. 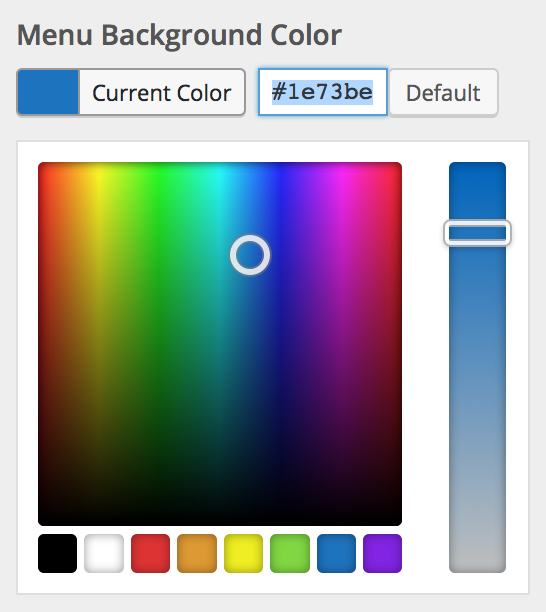 Within the Customizer, select the Colors panel to view the color options. You will see a list of options to control colors for various elements of your site. Change colors by clicking the Select Color button beside each color swatch to open the color selection tool. Watch your changes in real-time as you drag the selectors around to choose a color, or manually input a hex code color. Upon choosing your desired colors for each element, click the blue Save & Publish button at the top of the Customizer. Beyond changing global site colors within the Customizer, you can also change text colors on any page or post within the content editor. In addition, you can use shortcodes to display buttons and other elements in a variety of different colors.